Hamilton, Ontario is home to many members of the LGBTQ+ community and here, we invite people to gather together as one and learn about the LGBTQ+ scene throughout Toronto and Hamilton Pride. With a great array of events, special gatherings, meetings and general community information, we welcome users to the site and hope you find our welcome inviting. There have been many changes to the LGBTQ+ community over the past years and with Pride festivities and many other events, the city recognized the presence of a large LGBTQ+ community. Organizations within Hamilton Pride have taken active roles in Pride celebrations that are held throughout the year and there are many bars, clubs and restaurants that cater to members of the community. The overall scene is calm, relaxing and safe, providing any LGBTQ+ member the chance to enjoy the action of the city without fear. Offering many LGBTQ+ events and services, community members always have gatherings and ways to interact with other community members and there has been an increase in awareness and acceptance over the years, making Hamilton and Toronto two of the safest LGBTQ+ cities in Canada. The LGBTQ+ community is always growing and is a large part of the Hamilton LGBTQ+ area in Ontario. Due to the rising number of people joining info Hamilton Pride, there are many special events that will be planned throughout the year. These will include Hamilton Pride parades and festivals, informative services, information on schools and meet-ups, family picnics and outings and many other events. Special gatherings often take place in popular Gay neighbourhoods and provide a great way for community members to interact and gain knowledge, resources and information about what is available during Hamilton Pride. As the LGBTQ+ community grows, we will be adding information on where gatherings and meetings are being held. Community information is designed to inform members of local communities where they can go to be with others who are gay, bisexual, lesbian and trans and there are many amazing events that are scheduled throughout the year. The gay community is known for offering support to individuals, friends and family members and with the information, we will be offering, community members will always know where the action is, where services and gatherings are being held and where they can get more information on resources, support groups and more. The Hamilton and gay parade Toronto takes place every year in June and it is loaded with excitement, vendors and offers a great way for the community to gather. Each year, the Hamilton Pride parade attracts thousands from Toronto and other Canadian cities and it is the highlight of Pride week in Toronto. This event takes place in an area known as The Gay Village and it is just one of the amazing events that can be enjoyed during the week. 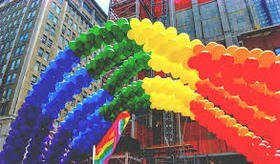 The Hamilton Pride parade celebration usually starts at 2pm and will last until 1 pm, featuring local artists, pop stars, string quartets and much more.